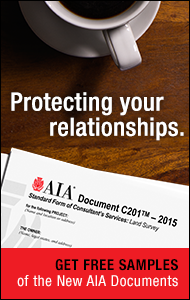 Nearly 200 forms and contracts comprise AIA Contract Documents. These forms and contracts define the relationships and terms involved in design and construction projects. Prepared by the AIA with the consensus of owners, contractors, attorneys, architects, engineers, and others, the documents have been finely tuned during their 120-year history. As a result, these comprehensive contracts and forms are now widely recognized as the industry standard. How does the payment program work? If you are joining, rejoining, or renewing as an Architect, Associate, International Associate or National Allied member for the 2018 dues year, you may enroll online in the 2018 Dues Installment Program online during October 1, 2017 - April 30, 2018. Program enrollment ends on April 30, 2018 and 2018 dues must be paid in full by June 30, 2018. Depending on when you enroll, you may enroll to pay your membership dues in up to six monthly installments. Members must enroll in the dues installment program at the time in which they renew or join. At the online payment checkout process, an option will be available to select “Dues Installment Program” and you may enroll to pay your membership dues. To enroll in the dues installment program, you must agree to the program’s terms and conditions and pay a $40 administrative fee that helps cover the costs of administering the program. ­The administrative fee will be distributed in equal portions to the member’s monthly installment payments. Rejoining members or New Graduate non-NAAB accredited degree holders or individuals enrolled in an AXP (formerly IDP) program working under an architect's supervision eligibility must download application. When may I enroll in the program? You may enroll in the 2018 dues installment program between October 1, 2017 - April 30, 2018. The first installment payment will be processed upon enrollment. ­Thereafter, the member’s credit or debit card will be automatically charged approximately the last business day of the month, according to the payment schedule. ­Members will receive an automated email confirmation of enrollment into the dues installment program once they have enrolled into the program Once you’ve enrolled in the program, you will not be able to adjust the payment schedule. you were an active member in 2017.
your renewing membership is currently lapsed due to non-payment of your 2017 dues. All 2017 outstanding balances must be paid in full in order to participate. you are a new member. you are a rejoining member. you have outstanding dues payments. you have outstanding payment plan dues payment. under the Continuing Education System (CES) Audit you have not completed your continuing education requirements. your membership is a State or Local Allied/Affiliate membership. ­State and/or Local Allied/Affiliate membership payments are not eligible for payment in the Dues Installment Program. May I pay by check instead of by credit card? Only credit card or debit card payments are accepted for the dues installment program. How will I be billed for the installments? Your credit or debit card will be charged on approximately the last business day of the month. For example, the first installment payment will be debited upon enrollment, regardless of the month in which you enroll into the plan. (And so, the first payment date may differ, from the remaining scheduled installment schedule.) Thereafter, your credit or debit card will be charged on approximately the last business day of the month. You will receive an email confirmation of enrollment into the program. Once you’ve enrolled in the program, you will not be able to adjust the payment schedule. * Must enroll at the same time you join or renew and will be charged on approximately the last business day of the month. If I owe a balance from my 2017 membership dues, am I eligible in the 2018 program? No, if you were enrolled in the 2017 payment plan program, you must complete the 2017 installment agreement before enrolling in 2018 payment plan. Do I need to certify a hardship to participate in the program? No, the dues installment program is available for new and renewing members without regard to hardship. You will be dropped from the program if a payment is not received within 30 calendar days after the due date. In this circumstance, any remaining balance on your 2018 dues will become due and payable immediately. You may update or change your credit card account by signing a new authorization form and submitting it by email or fax for. ­Contact Information Central at (800) 242 3837, option 2 for the enrollment form. My firm pays my dues. Can the firm enroll in the program on my behalf? Yes, if your firm wishes to enroll in the program on your behalf, it must enroll its Institute members individually online and authorize credit or debit account from which your dues can be paid. Be sure to complete one online enrollment per member. Can I opt out of the program later? Yes, you may opt out of the program at any time through a written request to do so. When you opt out, any remaining balance on your 2018 dues will become payable immediately. Can I cancel my membership if I enroll in the program? Yes, you may resign your membership at any time through a written request to do so. The Institute must receive full payment of your prorated dues until it receives your written resignation. Please email memberservices@aia.org.